Gabriel Said Reynolds is professor of Islamic studies and theology at the University of Notre Dame. He is the author of a number of books on the Qur’an and Muslim-Christian relations and lives in Granger, IN. While the Hebrew Bible and the New Testament are understood to be related texts, the sacred scripture of Islam, the third Abrahamic faith, has generally been considered separately. 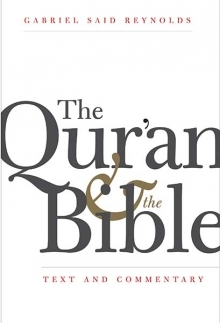 Noted religious scholar Gabriel Said Reynolds draws on centuries of Qur’anic and Biblical studies to offer rigorous and revelatory commentary on how these holy books are intrinsically connected. Reynolds demonstrates how Jewish and Christian characters, imagery, and literary devices feature prominently in the Qur’an, including stories of angels bowing before Adam and of Jesus speaking as an infant. This important contribution to religious studies features a full translation of the Qur’an along with excerpts from the Jewish and Christian texts. It offers a clear analysis of the debates within the communities of religious scholars concerning the relationship of these scriptures, providing a new lens through which to view the powerful links that bond these three major religions.